A central tenet of the HERCULES project is that landscapes are important components of individual and societal well-being. However, people value landscapes for a variety of reasons (and these are often in conflict with each other; some people appreciate a landscape’s potential to generate wind energy, while others are fond of the aesthetic values of landscapes). In the past decades, there has been a strongly growing demand for the intangible values of landscapes, called “cultural ecosystem services”. These can be cultural heritage values, the sense of place that people ascribe to a landscape, or the potential of a landscape for tourism and recreation. The growth of private and public nature reserves, tourism facilities, second homes, hobby farms, and residential homes in the countryside can all be understood as land uses stimulated by cultural ecosystem services. 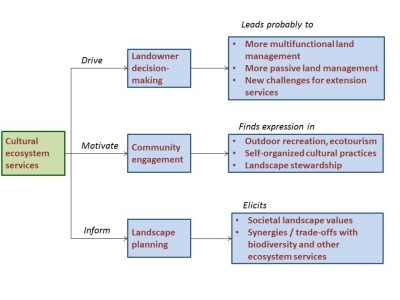 The most recent article in the HERCULES series of reviews around landscape change and landscape values is dedicated to the role that cultural ecosystem services play in owning, managing, protecting, and planning of land and landscapes. Among other issues, we look at how private forest ownership in Europe is increasingly driven by the demand for cultural ecosystem services (for recreation, for biodiversity, for wildlife, for living out in the countryside and many other specific reasons) rather than by economic considerations or by traditional timber production objectives. In Southern Germany, this group comprises an astonishing 37% of private forest owners; in England they make up even 47%. We find that such new types of land ownership can contribute to the multifunctionality of landscapes application, for example by applying management techniques for improved landscape aesthetics. However, many landowners influenced by cultural ecosystem services often lack the required knowledge of land management, and extension services are frequently not prepared for this group of landowners. Many rangelands in the American West are likewise owned by people that strive for cultural ecosystem services. Again, this trend opens up opportunities for more sustainable land management (compared to traditional resource-extracting land uses). But at the same time, cultural services-minded landowners come with problems of their own and can in extreme cases even exacerbate the pressure on the land. For instance, they might drive the fragmentation of larger properties into “ranchettes”, in which cultural services-motivated people often prefer to live. Where does that leave us? We suggest that the consequences of the desire for cultural ecosystem services on the management and planning of landscapes require a careful assessment. There is tendency for cultural services to encourage the maintenance of landscapes that have developed over a long time period. If change is not desired, for example when the goal is to preserve traditional land uses, then cultural ecosystem services may support landscape sustainability. If change is needed, for example to adapt to climate change, then cultural services may not necessarily support innovation as they tend to encourage the persistence of long-established practices. Plieninger, T., Bieling, C., Fagerholm, N., Byg, A., Hartel, T., Hurley, P., López-Santiago, C. A., Nagabhatla, N., Oteros-Rozas, E., Raymond, C. M., van der Horst, D. and Huntsinger, L. (2015): The role of cultural ecosystem services in landscape management and planning. Current Opinion in Environmental Sustainability 14: 28-33.